According to rental site Zumper, median rents for a 1-bedroom in San Jose are hovering around $2,200. But how does the low-end pricing on a San Jose rental look these days--and what might you get for your money? Here's a studio apartment at 452 N 15th St. in Downtown, which, at 350-square feet, is going for $1,400 / month. In the unit, the listing promises air conditioning, in-unit laundry, tile flooring, wooden cabinetry and a ceiling fan. Pet owners, inquire elsewhere: this spot doesn't allow cats or dogs. According to Walk Score, this location is somewhat walkable, is very bikeable and has a few nearby public transportation options. Then there's this 350-square-foot apartment at 617 S 9th St. in San Jose - University, listed at $1,625 / month. In the abode, there are built-in storage features, generous closet space and hardwood floors. The building has on-site laundry and pets aren't allowed. Listed at $1,695 / month, this 525-square-foot studio dwelling is located at 11730 Southwood Drive in San Tomas - North. Walk Score indicates that the area around this address is friendly for those on foot, is relatively bikeable and has some transit options. This 1-bedroom, 1-bathroom apartment, situated at 1207 Leigh Ave. in North Willow Glen / Gardner, is also listed for $1,695 / month. According to Walk Score's assessment, the surrounding area is moderately walkable, is quite bikeable and has a few nearby public transportation options. And here's a studio apartment at 7213 Rainbow Drive in Calabazas, which, with 400-square-feet, is going for $1,695 / month. In the unit, you're promised air conditioning, a balcony, a walk-in closet, granite countertops, closet space and hardwood flooring. Building amenities include garage parking, a swimming pool, on-site laundry, on-site management and storage. This spot doesn't allow cats or dogs. Walk Score indicates that the area around this address is very walkable, is convenient for biking and offers limited transit options. In the unit, there are a dishwasher, carpeted floors, closet space and a ceiling fan. When it comes to building amenities, expect assigned parking. Cats and dogs aren't permitted. According to Walk Score, this location is very walkable, is easy to get around on a bicycle and offers many nearby public transportation options. Listed at $1,875 / month, this 675-square-foot, 1-bedroom, 1-bathroom dwelling is located at 680 S 8th St. in Downtown. In the unit, anticipate a dishwasher, hardwood floors, wooden cabinets, a ceiling fan, granite countertops and ample natural light. The building offers assigned parking. Neither cats nor dogs are welcome. According to Walk Score, the surrounding area is somewhat walkable, is great for biking and offers many nearby public transportation options. Finally, there's this 504-square-foot, 1-bedroom, 1-bathroom apartment at 1617 Mendenhall Drive in Winchester West. It's being listed for $1,895 / month. 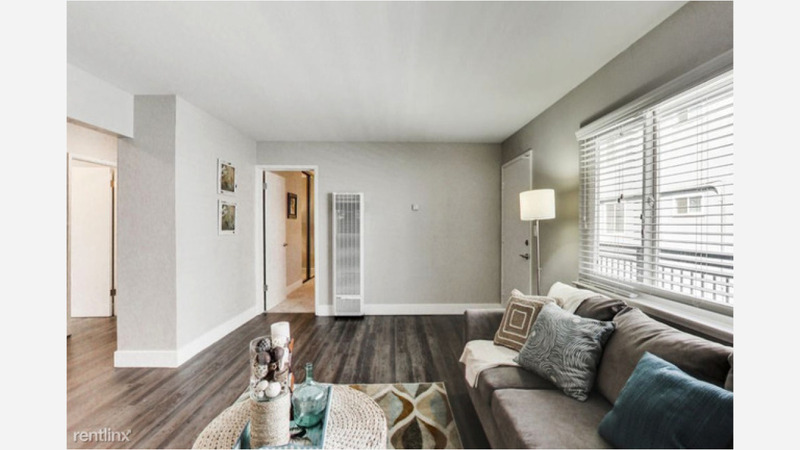 The unit has hardwood flooring, built-in storage features and great natural lighting. The building features on-site laundry, outdoor space, a swimming pool and on-site management. Cats and dogs aren't allowed.